Here are some movies that used ZBrush. No word back yet from Royal & Langnickel (R&L). If you have been reading the past few days, I emailed them about their Aqua-Flo brushes that fell apart during their first use. I just emailed them yesterday, and today is Friday before the New Year’s Eve so I suspect they will get back to me sometime next week. Let’s hope. While waiting for R&L to reply, today I am pleased to announce that I finally have new hardware! Now I have a machine that is capable of running programs like ZBrush by Pixologic (Yeah baby!). I have learned that even some of the prosthetic houses hire people who know ZBrush. This allows them to provide more options when a director comes to them and needs CG and practical effects. ZBrush is NOT cheap (around $699), so I am going to give it the old college try and download the free 30 day trail first. In my previous carrer I worked with computers everyday, but I haven’t tickled the keyboard & mouse for money in quite a while (or at least the chance to generate income). I will let you know how it goes. ZBrush is a 3D sculpting and modeling program that also let’s you create illustrations in 2D & 2.5D. 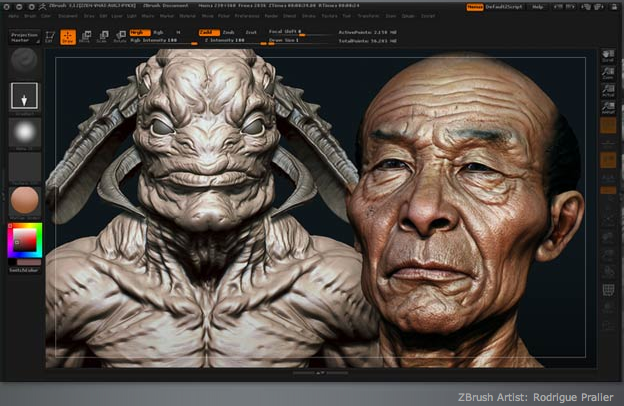 Check out the ZBrush Overview page for more information. Please feel free to leave comments and let me know what you think. If you have tried ZBrush or a similar program, I would love to hear about it. Hello Shari. Our offices are closed for the holidays and will reopen on January 2nd. Have a Happy New Year! Hi Shari. Well, we are all back in the office and I want to personally handle your order. If you could send me an email with your shipping information, I can have your replacement product sent out tomorrow. Please email me at maryanne@royalbrush.com. Have a great evening and thank you for your support of Royal & Langnickel! Hi Maryanne, Thanks for the response. I sent all my shipping info to customer service back on 12/29, but I will forward that email to you today. Thanks again!